This is dangerous for the defence as Warrick Gelant bursts through to advance the South Africa attack. South Africa have won 80 rucks so far this game. 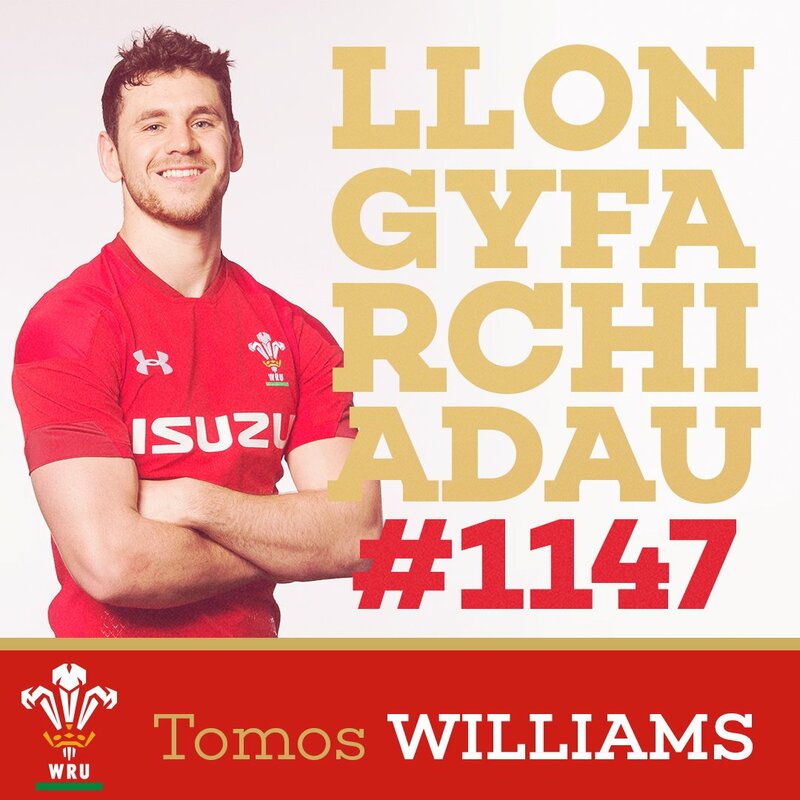 Tomos Williams departs for Wales. Embrose Papier comes on for South Africa. Gareth Anscombe has hooked the conversion to the left of the posts. Wales are only a few metres out, surely they must score! And they do with Ryan Elias touching down. Robert du Preez makes no mistake with that penalty goal attempt. Robert du Preez comes on. What a tackle there by Cory Hill as he saves a certain try!. That's a great try assist by Jesse Kriel. A series of passes by South Africa results in a try for Makazole Mapimpi. Owen Watkin (Wales) is shown a yellow card. South Africa decide to make a substitution, with Sikhumbuzo Notshe getting some game time. South Africa decide to make a substitution, with Daniel du Preez being replaced. South Africa make a substitution with Armand van der Merwe coming on. South Africa make a substitution with Chiliboy Ralepelle coming off. Wales sub Rhodri Jones comes onto the field. Dillon Lewis departs for Wales. Gareth Anscombe steps up to take the penalty but pulls it wide and to the left. The defensive line has been broken as Andre Esterhuizen goes through the gap. Warrick Gelant comes on for South Africa. Curwin Bosch leaves the field. What a run here by Ross Moriarty as they gets over the gainline!. Gareth Anscombe kicks the penalty. Ellis Jenkins has made 10 good tackles so far this game. Thomas du Toit comes on. Travis Ismaiel makes the break as the defence re-enacts the parting of the red sea. Travis Ismaiel intercepts the pass to race ahead and score the try for South Africa. South Africa decide to make a substitution, with Curwin Bosch getting some game time. South Africa decide to make a substitution, with Warrick Gelant being replaced. Gareth Anscombe converts the try. A stunning solo try from Tomos Williams. Fabulous play by Wales has led to Gareth Anscombe being able to wriggle through a gap. South Africa make a substitution with Warrick Gelant coming on. South Africa make a substitution with Curwin Bosch coming off. Gareth Anscombe has kicked a conversion. Ellis Jenkins sets up the try. Trouble here as Ross Moriarty breaches the defence. Great hands by Wales leads to a try for Hallam Amos. This is dangerous for the defence as Daniel du Preez bursts through to advance the South Africa attack. Wales sub Hadleigh Parkes comes onto the field. Steff Evans departs for Wales. Kwagga Smith comes on for South Africa. Sikhumbuzo Notshe leaves the field. Gareth Anscombe steps up to take the penalty but pulls it wide and to the right. The defensive line has been broken as Makazole Mapimpi goes through the gap. Embrose Papier is also on the field and with less than two minutes to go, Wales force a turn-over with the Boks on the attack. A couple of mistakes by the Boks and Wales are back in midfield with a scrum feed. The scores are still tied with 10 minutes to go in DC. 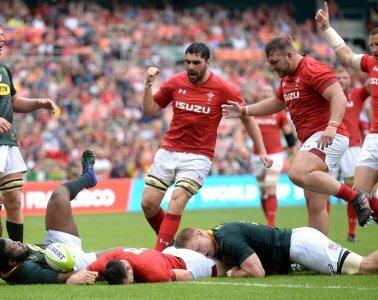 Both Bok wings, on debut, grab tries against Wales. Who remembers @BryanHabana doing the same in London 14 years go? Jantjies levels the scrores with a great conversion - 17-17 with 20 minutes to go. Great try by the Boks after two very strong scrums - Makazole Mapimpi goes over in the left hand corner for his first Test try! 17-15 now. Some deliberating by the match officials and Wales lose a man to the bin for a professional foul on their own tryline. And Notshe is back on the field for Dan du Preez at No 8. Wales penalised at the scrum and the Boks kick for the corner. Elton Jantjies adds the extras and we have a four-point game in Washington DC with Wales leading by 14-10. And Elton Jantjies gets the second half underway - come on boys, we need 40 massive minutes now! Bosch is back on the field. Warrick Gelant is on for the Boks, it looks like Curwin Bosch has gone off. Penalty against SA just outside the 22. Wales opt for a shot at goal and Gareth Anscombe pushes it wide. Still no score after five minutes.